My name is Ben Haller. I was a graduate student once, but I have reached my next life stage. It is time to disperse. During my juvenile stage, I worked on my PhD with Andrew at McGill; protected from predators, and optimally oxygenated as he fanned his nest, I flourished and grew. But now I have hatched; I passed my defense on June 3rd, moved from Montreal to New York on June 4th, and submitted my final thesis on June 6th. Now it’s time for me to start foraging for myself. My thesis, "The role of heterogeneity in adaptation and speciation", is still grinding its way through McGill’s bureaucracy, but I’ve posted it online at the link given. At 309 pages, it’s a bit of a long read, so I’ll give a quick summary here! Chapter 1 is a broad introduction to foundational concepts, ranging from adaptation and fitness landscapes to gene flow, reproductive isolation, and magic traits. One of the key ideas presented is the idea of “squashed stabilizing selection”, a combination of stabilizing selection and negative frequency-dependent selection (Fig. 1). Figure 1. Types of selection: (a) directional, (b) stabilizing, (c) stabilizing and directional, (d) disruptive, and (e) “squashed stabilizing selection”. Top panels show the fitness function: fitness as a function of phenotype. 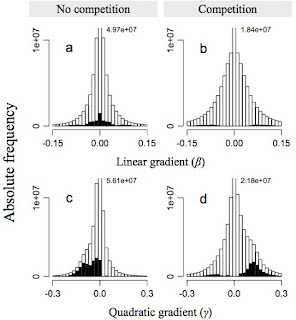 Bottom panels show the effect on a population’s phenotypic distribution, before (solid line) and after (dotted line) selection. See thesis for details. Chapter 2, “Solving the paradox of stasis: Squashed stabilizing selection and the limits of detection”, is currently in revision at Evolution. In it, I use an individual-based model to show various reasons why stabilizing selection might be difficult to detect even when it’s present, perhaps explaining the low rate of detection of stabilizing selection in Kingsolver et al. (2001). This might help to resolve the long-standing “paradox of stasis”, since it suggests that stabilizing selection might be common in nature despite its infrequent detection. Furthermore, my results suggest that squashed stabilizing selection might be quite common in nature, which might be quite important in explaining patterns of standing genetic variation and speciation (Fig. 2). Figure 2. 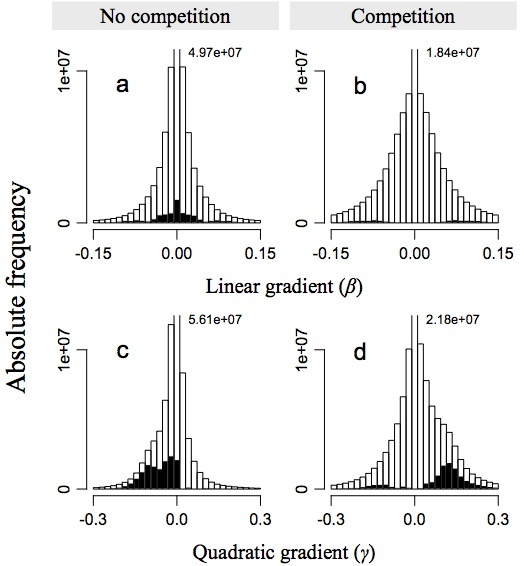 Absolute frequency histograms of linear selection gradients, β, and quadratic selection gradients, γ, observed for the modeled population. White bar areas represent non-significant selection, black bar areas represent significant selection. The left column summarizes model realizations without competition, showing that stabilizing selection is detected much more frequently than disruptive selection in that scenario. The right column summarizes model realizations with negative frequency-dependent intraspecific competition, showing that disruptive selection is more commonly detected in that scenario. Overall, significant selection is rarely detected, as in studies in natural populations. Chapter 3, “Evolutionary branching in complex landscapes”, is in press now at the American Naturalist. It uses an individual-based model to examine the effects of complex spatial environmental heterogeneity on evolutionary branching in asexual populations. Among other results, we find a novel “refugium effect” that promotes branching in complex landscapes that combine steep gradients and patchy heterogeneity (Fig. 3). Figure 3. A complexly heterogeneous landscape. In the steep gradient on the right side of the landscape (blue), refugia are generated by the spatially continuous patchiness (green). These refugia can provide evolutionary stepping-stones that promote adaptation to the harsh conditions of the gradient, which might otherwise be too extreme to allow evolutionary branching to occur. 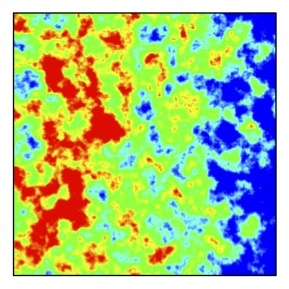 This “refugium effect” appears to promote branching in complexly heterogeneous landscapes. Chapter 4, “A tale of two morphs: Modeling plant-pollinator interactions, reproductive isolation, and local adaptation in parapatry”, is currently in review at Evolution. 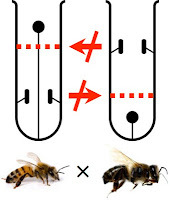 It examines the idea that heterostyly, floral syndrome that involves two different floral morphs with different, and reciprocal, reproductive organ positions, might allow reproductive isolation to develop between parapatric populations, promoting adaptive divergence and speciation (Fig. 4). We show that this outcome does appear plausible, but that other interesting outcomes can also occur, including strongly asymmetric gene flow that might promote the development of dioecy from heterostyly. Figure 4. An illustration of the hypothesized mechanism of reproductive isolation between populations of heterostylous plants, as a result of the combination of precise pollen transfer and reciprocal herkogamy. 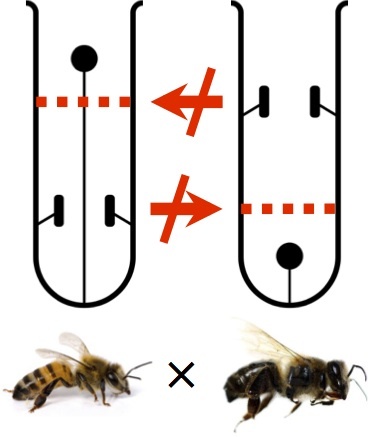 Differential organ positioning between the populations is the result of adaptation to different local pollinators, and results in decreased pollen flow between the differently adapted flowers. Chapter 5 presents some concluding remarks and a discussion of future research directions. I use a flowchart to show how the preceding chapters fit together into an overall conceptual framework (Fig. 5). Figure 5. A flowchart depicting the chain of causation that propagates heterogeneity upward from its initial ecological causes (squashed stabilizing selection and environmental heterogeneity) into heterogeneity among individuals, populations, and species. My defense went pretty smoothly, all things considered. I was quite nervous when I started talking – so nervous that people in the audience could tell I was nervous, which I can usually conceal! But I settled in, and except for some difficult questions from one member of the committee, I felt fairly confident through most of it. As Andrew told me repeatedly in the days before my defense, there really isn’t anything to worry about; if you’re not ready to defend, your advisor or your committee or your thesis examiners will tell you so. By the time you get the green light to defend, you’re ready. So don’t sweat it. I’ve heard some people say that they actually enjoyed their defense, and were sad when it was over; I can’t say that I shared that feeling, though! So what’s next? I’ll be starting a postdoc in Montpellier this fall, working with Luis-Miguel Chevin at CEFE/CNRS, assuming I can convince the French government to issue me a visa. We’re interested in looking at questions having to do with G matrices, multidimensional niche spaces, phenotypic plasticity, and lots of other cool stuff. Stay tuned for details! Will I fall prey to selection against migrants, providing a cautionary tale to those contemplating their own dispersals? Or will I survive, and reproduce my ideas, showing that gene flow can have positive effects on adaptive divergence in changing environments? Will I reach reproductive maturity, and start spawning new graduate students of my own? Or will senescence take its toll, as my papers collect dust but not citations, and potential mate-collaborators leave me for more dominant scientists? Only time will tell! Until the fall, I’m more or less homeless; my wife and I plan to road-trip around the U.S., visiting friends and going to the Evolution 2013 conference in Snowbird, Utah. Maybe I’ll see you there! 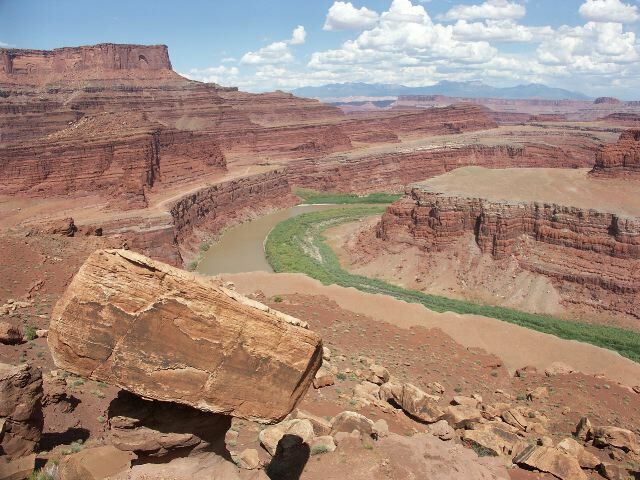 Canyonlands National Park in Utah, not so very far from Snowbird. If you attend Evolution 2013, take some extra days (or weeks! ), rent a car, and see the Southwest! The Living Dead: Darwin's finches and museums.